This installment was inspired by the recent Open Government Community Summit held at NASA on October 13, 2010 and many recent blog postings discussing variations on the death, sophomore slump and/or decline of Gov 2.0 and Open Gov (including “Sophomore slump for Open Government?”, comment thread of “What Gov 2.0 Needs Now”, “Will Gov 2.0 and Open Gov Die?”). 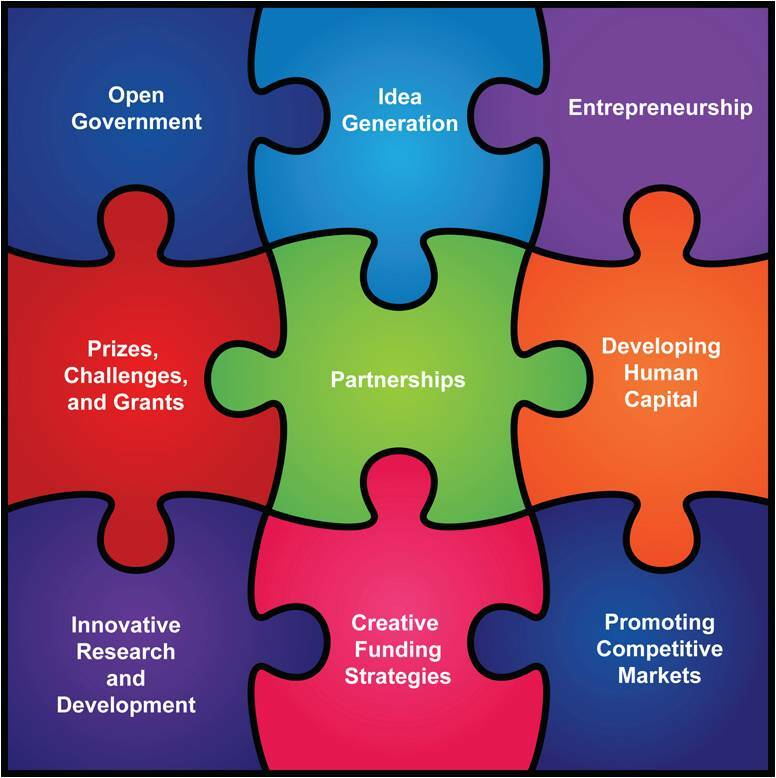 Over the last year my colleagues and I at POCG have been striving to contextualize the Open Government Initiative within a broader innovation vision. This presentation from the Summit introduced some of our thinking to the attendees. This blog posting shares the same thinking. Bottom line: Open Government is not dead. However, Open Government initiatives are only part of what is required to cultivate an innovative agency culture. They are an important part of a much larger innovation ecosystem, but only one part nonetheless. To cultivate a culture of innovation, the broader picture of what “innovation” means to the Federal Government is critical to understand. True innovation powered by good ideas is a tricky thing. Before you continue reading, I highly recommend you take five minutes to watch this great video “Where good ideas come from” for a walk through one depiction of the evolution of great ideas over history. What Gov 2.0 champions, Open Government Senior Accountable Officials, and the feds and consultants that support them have been trying to do over the last year, under the direction of the Open Government Directive, is complicated and incredibly difficult. Over the last couple years agencies have been experimenting with apps contests, data release and visualization, social media, and other Open Gov related efforts. These are huge efforts within themselves given the technology, policy and cultural barriers to implementation that exist. But to create the lasting change that will truly revolutionize government performance, many of those individuals have realized that establishing a culture of innovation that has permanence, is institutionalized, and directly improves mission delivery is paramount. It’s creating that culture of innovation that seems impossible but is one of the most important outcomes of all this recent Open Gov and Gov 2.0 activity. The jury remains out on how the variety of initiatives we’ve already undertaken will support a culture of innovation. As Dan Morgan (@dsmorgan77), an Open Gov Associate at POCG, would say “Government can create new spaces where ideas can collide, ecosystems can form, and innovation can be nurtured. It can do this in benevolent fashion, such as with prizes and competitions. It can do this with open data either actively (Community Health Data Initiative) or passively (simply releasing data on data.gov). It can use these tools internally (DOT’s IdeaHub, etc.) as well as externally (Unemployment Insurance reforms) to improve data quality, drive better data-driven decision making in formulating policy, achieve program performance targets, and ultimately deliver improved outcomes.” But this requires a fundamentally new way of thinking about how the government does business, across the board. It requires a culture of innovation throughout the business—not just in Open Government offices. Does this vision seem a bit broader than the mandates in the Open Government Directive? It is. This vision is discussed in the President’s Strategy for American Innovation. If you haven’t read that document in full yet, I highly recommend you do. 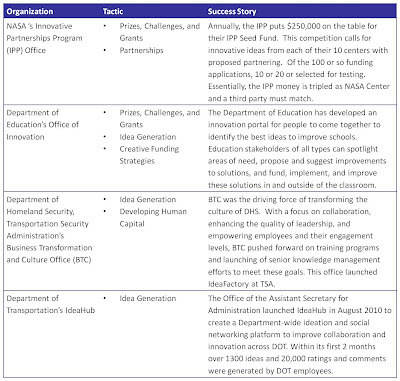 Figure 1 below displays some of the tactics that are mentioned in this Strategy to drive innovation. Within the context of the Strategy, Open Government is a critical enabler in accomplishing all of the key outcomes. Within this context, an Open Government can transform, accelerate, and increase the value of the outcomes of innovations. Open Government is only one enabler for innovation. So what does this mean to the heroes out there that are struggling to advance the principles of Open Government every day? It means they are not alone. It means there are other tactics that are likely being employed at their agencies that share a common vision for innovation. It means that there is a larger context within which Open Government principles lie. Obviously, some of the puzzle pieces shown in Figure 1 overlap in theory and in practice. Table 1 below highlights some examples where Agencies are taking significant steps towards creating an innovative culture leveraging some of these tactics. Many of these efforts might be unknown in the current Open Gov context because of how we’ve framed the discussion around Open Government and Innovation. So for all you Open Gov practitioners, advocates, and heroes out there, what does this re-framing mean to you? It should help you further your objectives with new tools in your tool belt. Identify other innovation leaders in you agency. Bring those innovation leaders to cross-agency events and get them familiar with the Open Government Initiative. Become familiar with their programs and goals. You can be each other’s greatest allies. If your managers are resistant to Open Gov, try broadening the conversation to one of Innovation. It’s hard to argue with pursuing innovation to improve mission performance. 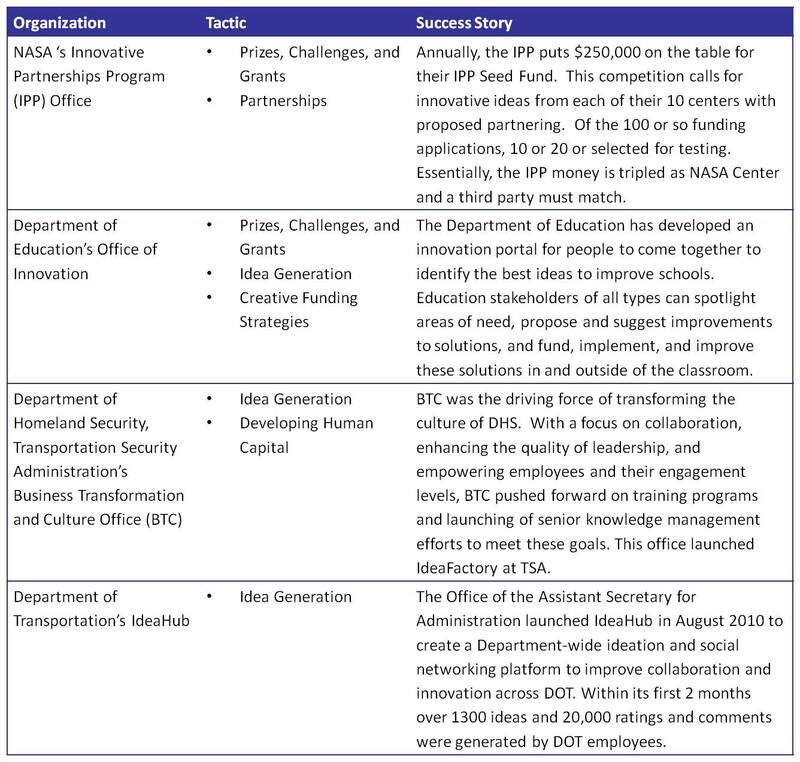 Leverage Open Gov initiatives and pilots as success stories for innovation. I’ve blogged before on many of the other puzzle pieces (including prizes and competitons,partnerships for sustainability, partnerships to create secondary markets to fill funding gaps, andpartnerships to develop infrastructure) and will make an effort to focus on some of the others in future blog postings. What are some other great examples of Agency innovation that are benefiting from the principles of transparency, participation and collaboration that you know of? What do you think about elevating the conversation from one of furthering “open government” to furthering “innovation”? What are the unintended consequences of such a scoping? Newer PostFocusing on WHY to Drive Adoption: iPad is Current, Learning and Productive. What is Government?